Flutist Molly Barth and guitarist Dieter Hennings join forces to form Duo Damiana, a trail-blazing ensemble dedicated to pushing the boundaries of flute and guitar music. 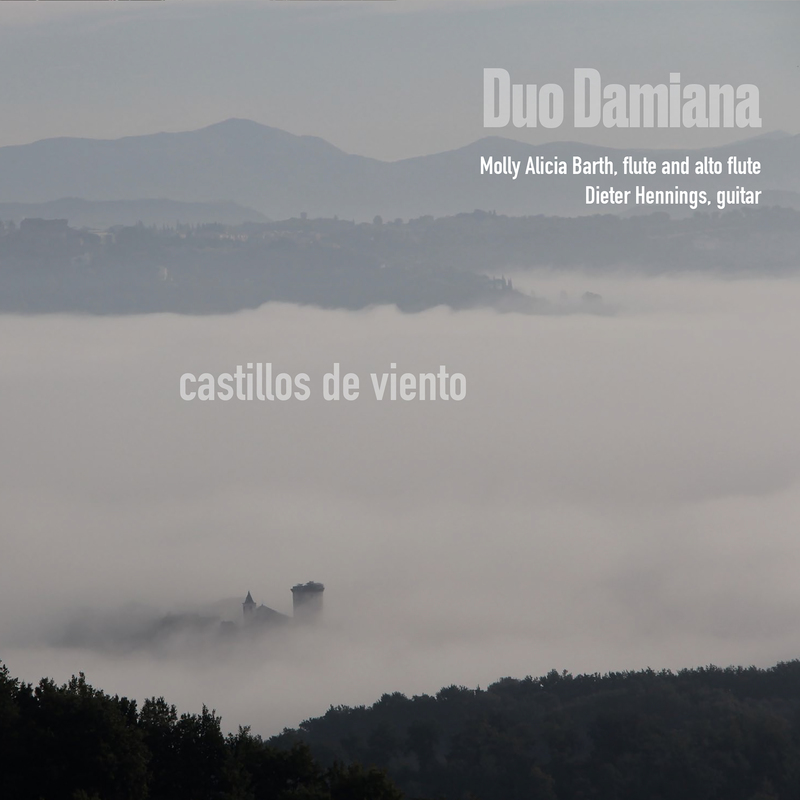 In their debut album, titled Castillos de Viento (Castles in the Wind), Duo Damiana has gathered some of today’s most captivating voices. Composers Michael Fiday, Jesse Jones, Shafer Mahoney, Hebert Vázquez, and Chen Yi provide a powerful soundscape that emphasizes both the individual beauty of each instrument as well as its collective power. An album with a unique global vision in mind, the works by Fiday, Vázquez, and Yi look East to Japan and China for its inspiration, while the works of Mahoney and Jones are deeply rooted in the American tradition. The title castillos de viento refers to the "ephemeral yet powerful nature of music. Although intangible, it reaches emotions that are rooted in solid, cogent, timeless ground within us." El jardín del pasaje púrpura (the garden of the purple passage), written by Hebert Vázquez, alludes to a Japanese garden with cherry blossoms. Michael Fiday’s 5 Haiku are a set of varied musical reflections on texts by the 17th-century Japanese haiku master Matsuo Basho, their concise forms revealing an entire world within. The rich elements of authentic folk music from three minority nationalities in China West are the subject matter of Three Bagatelles from China West by Chen Yi. The quiet, introspective nature of Shafer Mahoney’s Shining River was inspired by the writings of John Muir, the American naturalist. Jesse Jones is the recipient of numerous awards, including a Guggenheim Fellowship and the Elliott Carter Rome Prize in Composition from the American Academy in Rome; he has written a four-movement tour-de-force for Duo Damiana. Barth, a founding member of the contemporary powerhouse ensemble Eighth Blackbird, and Dieter Hennings, of the Eastman Broadband, both prolific in their individual projects, come together to provide what will surely be a referential recording in its field. Barthis Associate Professor of Flute at the University of Oregon and Hennings is Associate Professor of Guitar at the University of Kentucky.